I loved everything. Jess is very is easy to deal with. Her items are top notch. I highly recommend. Hunting Creek / Vane Brothers / Tugboat / Boat / Watercolor Print / Wall Art / Nautical Decor / Available in 5x7" & 8x10"
My husband is a tug Captain and this was meaningful to us 💜 so glad I stumbled upon it! 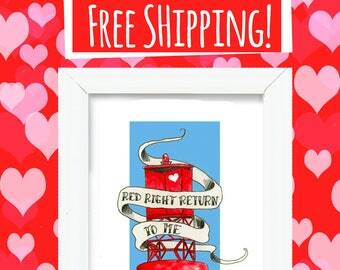 Red Right Return To Me / Nautical / Buoy / Mixed Media / Art Print / Wall Decor / Sailor Gift / 8x10" & 5x7"
Red Right Return To Me *FREE SHIPPING* Valentine's Day Gift / Nautical / Love Heart Red Buoy / Art Print / Sailor Gift / 8x10" & 5x7"
I cannot be held responsible for packages that are lost or damaged in the mail. If you are unsatisfied with your print, please contact me. Refunds will only be made on a case-by-case basis. This shop accepts credit cards, debit cards, Etsy gift cards, and PayPal. Prints ship within 3-5 business days via USPS Priority Mail after confirming payment. Items are placed in a clear cellophane sleeve supported by cardboard to ensure a safe arrival.